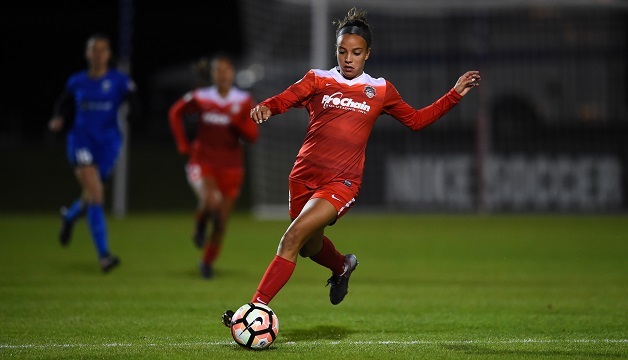 Boyds, MD (Sept. 30, 2017) – Despite a first half brace from U.S. international forward Mallory Pugh, the Washington Spirit fell 3-2 to visiting Seattle Reign FC in Saturday night’s 2017 NWSL season finale with 3,780 fans on hand at the Maryland SoccerPlex. Seattle stormed back from a 2-0 halftime deficit with three unanswered goals in the second half, all in the final 19 minutes. Welsch international Jess Fishlock had a hand in all three goals, scoring two and assisting one. Reign FC’s first goal came in the 71st minute off the right foot of Fishlock, struck into the top center of the net from the right side of the box. Kiersten Dallstream provided the assist on the play. Larissa Crummer netted the equalizer for Seattle in the 83rd minute, less than five minutes after entering the game as a substitute for Beverly Yanez. Fishlock registered the assist on Crummer’s strike into the center of the net from the left side of the box. Fishlock scored the game-winner in the 90th minute, sending another right-footed strike into the upper netting. Overall, Washington outshot Seattle 19-12, with nine shots target to Reign FC’s seven. Pugh led all players with eight shots, five of which were on frame. Caprice Dydasco and Tori Huster finished tied for the team lead with 56 passes each. Season tickets for the 2018 Washington Spirit season will be available starting on Tuesday, October 3.